We couldn’t be more thankful for the more than 20 people who joined us for our first Cacapon River Cleanup of the year! 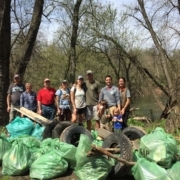 On Saturday, April 13, these dedicated volunteers worked hard to remove close to 40 bags of trash, 10 tires, and countless other rubbish from the banks of the Cacapon River. It’s only through the help of special, passionate volunteers like these that the Friends of the Cacapon River is able to achieve our goal of removing as much trash as we can from our river this year. Together we can keep the Cacapon clean! Many thanks to: Clint Adams and Katie Dworak, Neil and Katie Cotherman, Melanie Currier, Nick, Rachel, and Judy D’Agostino, Lucy Duff, Kara Ford, Adam Griggs, Bob Kern, Mary and Alyson Lipscomb, Allison Pinder, Paula Porpilia, Dan and Kris Tritsch. Hands-on, dirty, and gratifying! 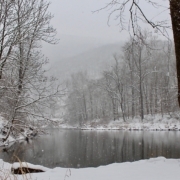 Roll up your sleeves and help the Friends of the Cacapon River cleanup our river. Join our passionate volunteers who are working hard this year to keep the Cacapon River beautiful and clean by removing trash, litter, and old tires from our river’s waters. 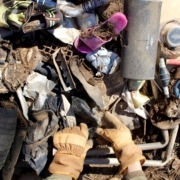 Our first river cleanup of the year will kick off on Saturday, April 13, 2019, at 11 AM, at the Great Cacapon Public River Access Site in Morgan County. This family-friendly volunteer event is a wonderful place to meet other like-mined river people while helping clean up the Cacapon River! Please wear appropriate clothing, such as boots and long pants that you don’t mind getting dirty. We encourage you to bring your own water bottle, too. The cleanup with start with a very brief introduction on the Friends of the Cacapon River and on cleanup safety. We’ll provide the bags, work gloves, and “trash grabbers,” as well as drinking water and some light snacks. Then it’s off we go to remove as much trash as we can! 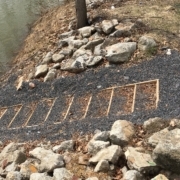 Directions: The Great Cacapon Public River Access Site is located off Rt. 9, about 1/2 mile from the U.S. Post Office in Great Cacapon. It’s under the green trellis bridge and marked with a brown street sign that reads “Public River Access.” If you’re coming from the Berkeley Springs area, you’ll make a left turn on the gravel road before the green bridge. If you’re headed from the Paw Paw area, you’ll make a right turn after the bridge. What better way to support our work than grabbing one of our new, awesome shirts. 100% of the proceeds go to protecting the river we all love. They’re super soft and only $25 each. 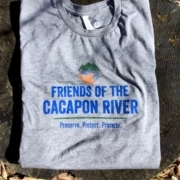 But why not show even more love for the Cacapon River and donate $100 today—you’ll get a free shirt when you do! 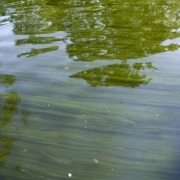 Let’s keep the Cacapon clean!